Searching for easy, care-free, low maintenance living on the Eastside? Look no further! 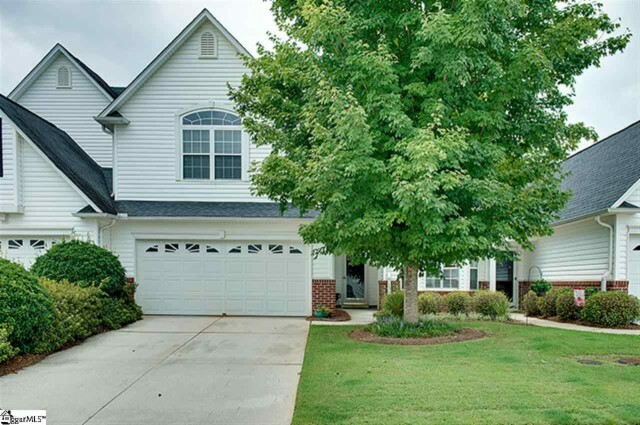 Impeccable 3BR / 2.5BA townhome in Greer SC nestled on a cul-de-sac lot in the gated community of Thornblade Crossing Greer SC. This wonderful neighborhood offers the security of a close-knit community but also appreciates the need for privacy. It is ideally situated near Pelham Road/I-85/I-385 which makes it convenient to shopping, restaurants, GSP and downtown Greenville. Another added bonus, it is located in one of Greenville’s top school districts. If the lure of a fantastic location and practical townhome living isn’t enticing enough, this functionally stylish, ready to own Greer SC townhome will certainly persuade you. It features an open floor plan with gleaming hardwoods thru-out GR/DR/KIT. The KIT has solid surface counter tops, full appliance package with smooth-top stove and offers plenty of cabinet space. A raised bar top gives extra counter space and allows for another eating or gathering area next to the GR. The GR is highlighted by a gas log fireplace with exquisite marble surround, a niche above fireplace for flat screen TV and French doors which lead out onto a large patio area. The DR has a cathedral ceiling and natural light cascades within from the surrounding windows. The MBR suite boasts of a cathedral ceiling, huge walk-in closet, raised double vanities with make-up desk, separate shower and garden tub. This cul-de-sac lot is the premier location in the neighborhood and provides more privacy/less traffic. The lawn showcases mature landscaping and is complemented by sod grass and in-ground sprinkler system. Other features include attached two car garage, upstairs laundry, intercom/entertainment system, 2” plantation style blinds, crown molding, fresh paint and new carpet. All appliances are to remain. Community amenities consists of security gate, pool and some common areas. The regime fees include lawn maintenance, termite contract, street lights, exterior/common area insurance.